Scott Visovatti, MD discusses how early treatment of patients with abnormal exercise studies can delay, or even prevent, the development of pulmonary arterial hypertension. Dr. Visovatti is an Assistant Professor of Internal Medicine in the Division of Cardiology at the University of Michigan. 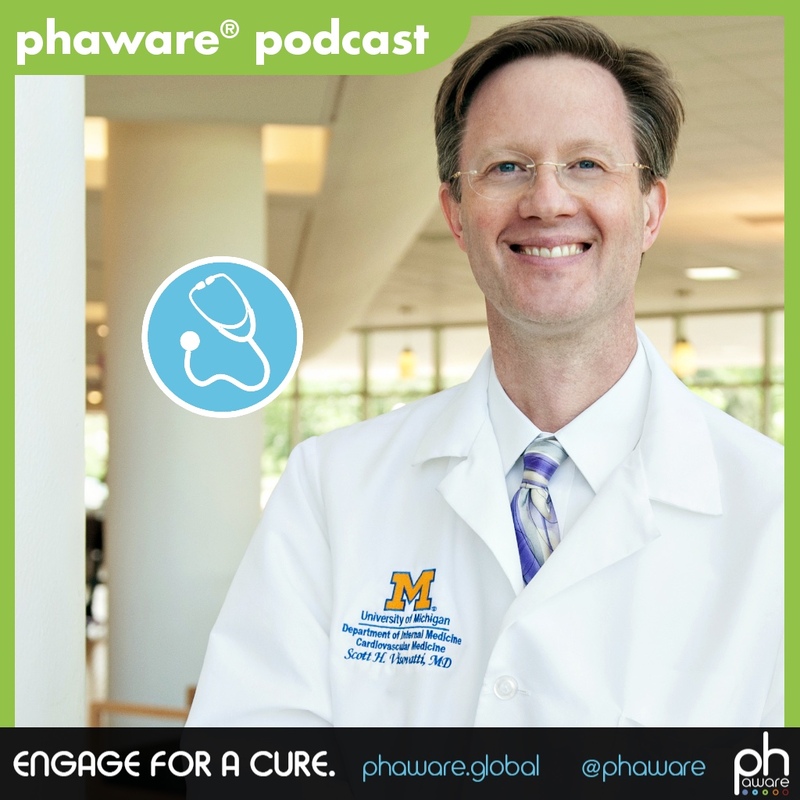 As a physician-scientist in their Pulmonary Hypertension Program, he cares for patients in clinic, performs clinical research that investigates the role of exercise in the diagnosis of pulmonary hypertension, and runs a basic science research lab aimed at exploring the role of purinergic signaling in the development of pulmonary arterial hypertension. My name is Dr. Scott Visovatti. I am a cardiologist and assistant professor of internal medicine at the University of Michigan. I'd like to talk a little bit about the role of exercise in the diagnosis, and perhaps even, predicting the future of patients with pulmonary hypertension. What we know is that there are groups of folks who are at risk for developing pulmonary hypertension, or pulmonary arterial hypertension, which is a sub group. Those folks include patients with connective tissue disease, like scleroderma, or patients that have had blood clots in their lungs. Now we know not everyone with scleroderma, or everyone with a blood clot in their lung will go on to develop high pressures in their lung, which can ultimately lead to right sided heart failure and death. Obviously, this is a critical issue to figure out. How do we tell a patient what the future may hold? If I could give an example of a patient with scleroderma who comes in to see their rheumatologist, or their cardiologist, or their pulmonologist, and that person is concerned that their exercise status has changed. They can't do as much as they could at last visit. They're having difficulty climbing a flight of stairs. Or even speaking complete sentences. Typically, we would get an echocardiogram, perhaps pulmonary function tests, other studies, that would accurately assess what the pressures are in the heart and in the lungs. That's something that we do with a study called the right heart catheterization. [A right heart cath} is basically putting an IV in the side of the neck, or in the groin, into a vein, and threading a catheter that can measure pressure up through the heart and into the main artery of the lung. That's the gold standard test. There are specific cut offs that tell us whether or not a patient has pulmonary arterial hypertension, based on pressures and some calculations. The difficult situation here is that sometimes we find that they don't meet criteria for pulmonary arterial hypertension, yet they're still feeling poorly and there's always that cloud hanging over them in the sense that great, today they don't meet the diagnosis criteria, but what does the next week, or month, or even year hold in store for them? Based on some work that we've done at the University of California, Los Angeles, by Dr. Khanna, who's a very prominent rheumatologist who we're happy to have here at Michigan, and we work very closely together. He found that exercise can basically unmask different profiles. Meaning different collections of pressure data that might identify folks who are at higher risk for the development of pulmonary arterial hypertension down the line. We're working with him and Dr. McLaughlin and the group here at Michigan. We started not only performing these right heart catheterizations, measuring pressures at rest, but also with exercise. It sounds a little bizarre, but we can slide a bicycle, what we call an ergometer on the end of the table, where the patient is undergoing the heart catheterization. They can exercise while that catheter is in place. What we found is that there are very distinct patterns that can emerge when folks are really pushing themselves. The exciting thing here is that we are finding sort of a middle ground between normal pressures and pressures that would be diagnostic of pulmonary arterial hypertension. We think that this middle group, this pattern, that sort of in between those two extremes, it might predict somebody who is more likely to go on to develop this horrible disease. If we can identify those folks, we can follow them more closely. Our hope is that we can actually begin clinical trials to see if treating people with medication at that earlier intermediate stage would be helpful in preventing the actual development down the line of this disease. But that's something that we're working on very carefully right now. It's a hot topic and it really deserves some careful attention here. What came out of the newest World Symposium is this idea that our strict cut off for what's an abnormal pressure in the pulmonary artery was perhaps a little higher than it should be. In other words, from studies that show what a normal pressure is, we know that there's sort of a range of normal and abnormal. So, what our experts in Nice found last year was that we need to perhaps lower that cut off. So the mean pulmonary arterial pressure cut off had been 25 millimeters of mercury. Meaning up until that point, that was considered to be normal, or high normal. The important thing here is that the definition also required some calculations that showed that the arteries in the lungs were clamped down about three times normal, or greater. The new definition lowers that mean pulmonary arterial pressure threshold to 20 millimeters of mercury. So, a lower cut off there potentially capturing more people. However, that important point is that pulmonary vascular resistance, or the degree to which the arteries are clamped down, it's still necessary that that calculation shows three times normal, or greater. We've gone back since this new definition was put forth, and looked at our past diagnosis and found that this changed categories for very few people. Meaning that that would be a very unusual person that would now be included in the group of pulmonary arterial hypertension. But for that one person, that's a critical difference. That's somebody that we could now treat. Whereas before, it would be more difficult to justify treatment. So it's a slight difference. It doesn't really change the exercise world. What that last World Symposium concluded is that we still really don't have enough solid clinical data. Enough clinical trials to justify having a consensus definition for what the role of exercise in pulmonary arterial hypertension [is]. Which is why a lot of us who are working in this field are doubling our efforts to try to show that we do think exercise can show the middle ground that is on the spectrum. Meaning from health to disease. What we think is also exciting here is we're growing the offerings that we have for folks with blood clots in their lungs. Something called pulmonary embolism, which is a blood clot that typically breaks off from the legs and goes to the lungs. For most people that is something that the body handles by breaking down that blood clot. For a small group of people, the body doesn't have that capability or lacks the potency necessary to completely break down all those clots. So over time those blood clots can actually turn into scar tissue. What our center and others are offering is either a type of open heart surgery to surgically remove that scar tissue, or in a group of patients who aren't candidates for surgery, we are offering something called balloon pulmonary angioplasty, which is a little bit like what we offer to patients who have blockages in their coronary artery. We can put a catheter in and use a balloon to move that scar tissue off to the side and help blood flow to the lungs. But like that patient with scleroderma, we first have to prove that those pressures are high enough to give that person a diagnosis of what's called chronic thromboembolic pulmonary hypertension [CTEPH]. There are strict cut offs in terms of pressures. What we are finding is that we'll take a patient to the cath lab, perform that right heart catheterization and find that those pressures don't quite meet that definition of pulmonary hypertension. Again, they're feeling poorly, they're short of breath, they can't do what they did before they had this pulmonary embolism. So how do we help them? Well, we're using exercise here as well. Meaning all too often, it's the case that climbing a flight of stairs or going up an incline is the thing that's most difficult for patients like this. We want to try to recreate for their body, that same stress by exercising them, and watching to see if patterns of pressures show that sort of intermediate group, who are not quite normal, but still don't meet that definition of pulmonary hypertension. We believe that this may be a group who may require something sooner, rather than later. That something could be medication(s). It could be an angioplasty. Perhaps it's somebody who we need to watch all the more closely to see if surgery is in their future. So once again, using exercise as an evocative maneuver. A way to kind of put the body under a stressful situation to see if that can help us identify folks who really do need to be intervened upon earlier, rather than later. My name is Scott Visovatti, and I'm aware that I'm rare.